Located off the main street on the road to Merredin. Eight one bedroom semi-self contained units, all with twin beds. Tea, coffee facilities, TV fridge, laundry, parking, barbecue. Meals available from Roadhouse. Located on the main street of Dowerin. 30 hotel rooms with shared bathroom facilities. Tea/coffee facilities, lounge, fridge, restaurant, bar, laundry, conference facilities, continental breakfast, lunches on request. Lunch available Tuesday – Sunday and dinner 7 days. Pizza and Takeaway 7 days. 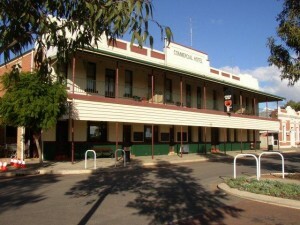 Quality accommodation in the heart of the Wheatbelt. Studio and One bedroom apartments, powered caravan and camping sites, well equipped camp kitchen, landscaped gardens and conveniently located. 1 Bedroom Unit: Queen size bed; well equipped kitchenette; wheel chair accessible bathroom, $130 per night. 1 Bedroom Studio Unit: Queen size bed; well equipped kitchenette; wheel chair accessible bathroom, $110 per night. Located off the main street on the road to Merredin. 22 powered sites available. Shared ablution block and laundry facilities. Barbecues are also available to guests. Meals available from Roadhouse. Totally unserviced sites, limited facilities for self contained caravans only, natural bush, sullage dump point and honour box for fees. Available during the Dowerin Field Days. Located within the recreation and Field Day’s complex. Bookings essential for Field Day use.